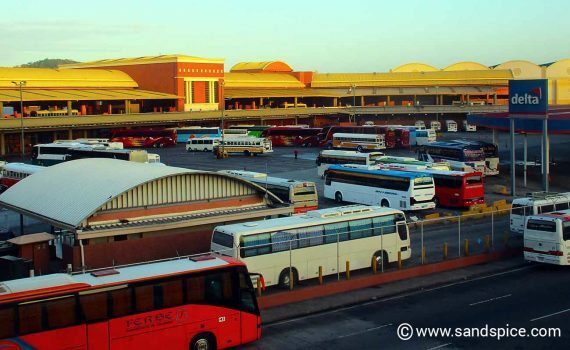 If you plan to travel from Panama City to Santa Catalina by bus, you’ll need to start your journey from Albrook’s bus station. The easiest and cheapest way to get there is by metro. 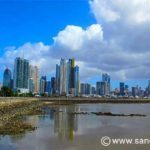 Before leaving Panama City for Santa Catalina, make sure you’ll have enough cash for your stay. There are no banks or ATM machines in Santa Catalina. 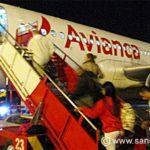 The nearest ATM is in Soná, 1½ hours away. You can buy a metro card in all metro stations for $2. However your card will have no credit. You’ll need to charge it up with a few dollarsat the same machine. You’ll need to use the card both on the metro and the bus – cash is not accepted. We found that each metro trip cost us 35 cents – bus trips are slightly cheaper at 25 cents. 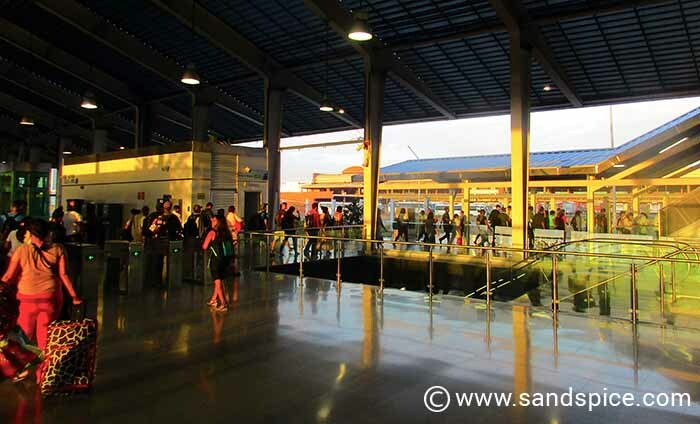 From the Albrook metro station, you cross the bridge over to the bus station. This is a well-organized place. There are 2 long rows of ticket booths, with destinations and schedules clearly displayed. 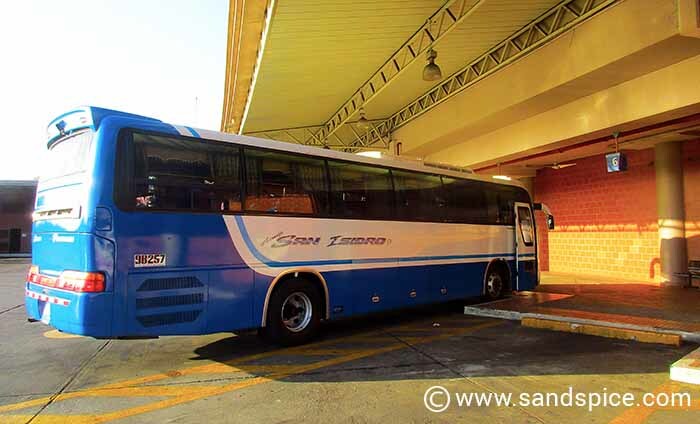 For Santa Catalina, you need to buy a ticket to Soná (Isidro bus company). 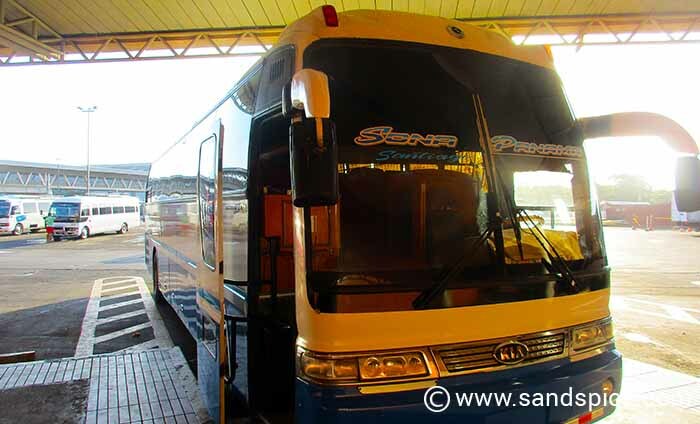 When you get to Soná you will have to change buses. We paid $11 dollars each for tickets. Before boarding the bus you have to pass through a card-operated turnstyle. One of the station staff will pass you through. You’ll notice plenty of signs around telling you that guns are not allowed on the buses. You probably aren’t allowed to smoke either, though I didn’t see any signs about that. Keep your valuables separate in a smaller bag because all larger bags and rucksacks have to go into the luggage hold. Our bus wasn’t very modern, but it did have airco, and comfortable seating. There were no toilets onboard. However, contrary to other reports, the 4½ hour journey is broken after 2 hours with a 15-minute bathroom-stop. 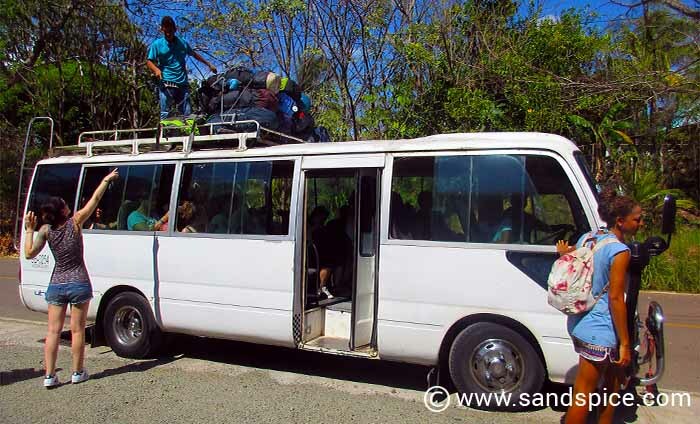 We arrived in Soná at a remote, small and underwhelming patch of sand – the bus terminal. 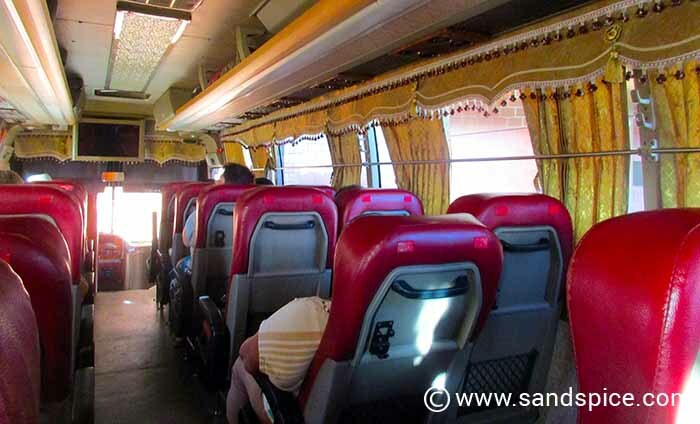 Here another – much smaller – bus was already waiting to take us onwards to Santa Catalina. If you want to get a seat, you’ll need to be among the first to reach the other bus. This is because everyone from the larger first bus has to be crammed into the much smaller second bus. All rucksacks travel on the roof. Make sure there’s nothing valuable or breakable in them. The 90-minute trip from Soná to Santa Catalina isn’t so comfortable, but the scenery is nice. As you arrive in Santa Catalina, keep an eye out for your guesthouse. They will drop you off if you shout. Otherwise you may have a long detour from the far end of the town. We had booked to stay 3 nights at the Iguanito guesthouse, close to the center of Santa Catalina. You pay your bus fare when you get off. It cost us $4.69 each.